So I’ll start out by saying that there wasn’t a real.. flaming need to get an ebook reader. I just wanted one. And I am at a point in my life where I can get things that I want. It’s also painfully difficult to get ebook readers in Finland. They have this mantra here. “There’s no point in publishing/selling ebooks, because nobody clearly buys them!”, which leads to “Nobody buys ebooks because there are no ebooks/readers to buy”, which leads to.. There are a few readers that you can get in Finland. Sony has had a few models available at Verkkokauppa.com for a while now. There are also some less known brands (to me, at least), like Bookeen. No idea about their product. But try to find a non-secondhand Kindle, or Nook or Kobo or some such device. You can’t! Or if you can, I stand corrected. The Sony products have not been attractive to me. Perhaps just because of the brand, or the format support (they do support epub, more on these later), and have things like a MicroSD slot and so on. The Bookeen models apparently su pport both epub and mobi, which sounds great! If anyone has experience with the Bookeen brand devices, please comment. They are cheap as dirt (54,90€ at Verkkokauppa), which makes me slightly suspicious, but the format support is intriguing. A great segue! The formats. There are two big formats. Epub and mobi. Epub is used by a lot of vendors. Mobi is used primarily by Amazon on their Kindle-series devices. PDF is almost universally supported (though, there are limitations), as are some image formats and common text formats. Some support doc, and docx, even xml-type formats. So what format should you go for? I went for mobi, and the Kindle ecosystem. Why? Well, mostly because of reviews. Amazon seems to have a fair selection with reasonable prices. There are probably the same amount of mobi-formated books, so that’s probably not the main reason.. The Kindle doesn’t even have expandable memory. But the screen is great. It has received near-universal praise, and looking at it in the store kind of sealed the deal. So why did I buy it in the US? Well because of the price. I paid $99 plus Nevada sales tax, (108 dollars was the total, I think. Don’t get me started on the stupid tax-free pricetags in the states..). I tried ordering one online. I went to amazon.co.uk. It told me I can’t order this product to my country (Finland, for those who are not regular readers). Why? Who knows. I didn’t find a solid reason. The price would have been about right (plus shipping of course), but I just couldn’t buy it. We’re all in the EU, so I wouldn’t even have to pay VAT or customs! So Amazon.co.uk directed me to Amazon.com. They, quite obviously, have the Kindles for sale. But if I order it from the States, I have to pay the price (around what I paid at Best Buy, where I got it), + shipping + 3.5% customs fees, + 24% VAT on the product + shipping. Which makes the price.. well not so attractive. I knew I was going to the US sooner or later, so I decided to wait. Like Chuck Norris. Because of reviews, I ended up with two finalists: The Barnes & Noble Nook Simple Touch with GlowLight, and the Amazon Kindle Paperwhite 2 (released in 2013). Basically both have impressive batteries (they promise ~8 weeks with 30 minutes of daily reading, and some wifi-use). The Nook supports the epub format. 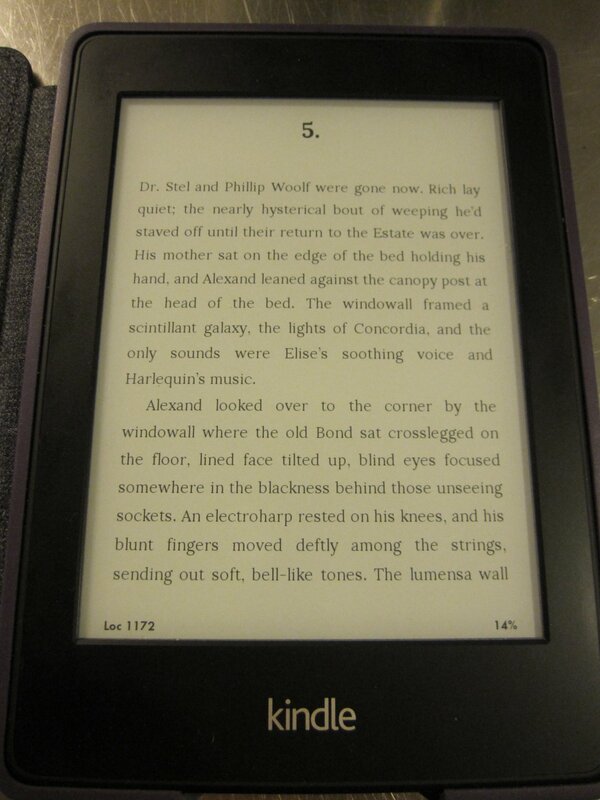 The Kindle supports the mobi format. The Kindle is said to have a slightly better screen. The Nook, on the other hand, has a MicroSD card slot (supporting cards up to 32GB). 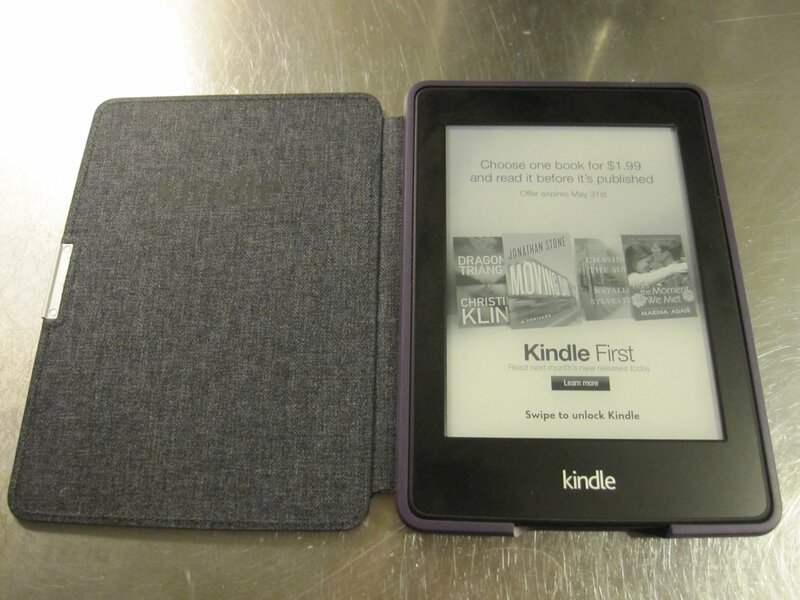 In the end it was the screen, and the physical appearance of the Kindle that sealed the deal. It’s simple, minimalistic, and not so plasticky and round as the Nook. I bet I would have been equally pleased with the Nook, had I not compared them side by side, and read all those reviews; most of them giving the Kindle a very slight edge against the Nook. So once I had traveled the 20 + hours (door to door) to Vegas, I set out to find a Kindle. I weighed different options, looking up stores that were near to The Venetian where I was staying. It was either a Frys, or a Best Buy. Both had the product in stock, with the same price (or close). It was Sunday, so Best Buy won by being open (and closer). I waked 2.3 miles (according to Google Maps) to get to the Best Buy on S. Maryland Parkway. After stopping by the Starbucks on Flamingo, which I had to do to prevent accute dying (it was nearly 40 degrees celsius! ), I finally got to the store. But I’m getting ahead of myself. I ordered it online, and selected store pickup. All this worked fairly well. I did have one issue. Best Buy offers two options for us foreign devils: 1) Order it to a US address (not sure if I could have ordered it to the hotel? ), 2) Pick it up from a store. Another caveat was, that if you wanted to pay by credit card, you had to use a specific billing address provided by Best Buy in their handy “international customers” guide. I did run into a problem. I couldn’t type a telephone number that it would accept. It just told me “Please enter a valid phone number in the format (555-555-5555) or something to that effect. I tried all manner of combinations, fake and real, but nothing would pass the mechanical devilry that was their online store. On the left hand side there was an option to “chat with a best buy customer support agent”. I considered my options. I could have just walked over, called the store.. .But being the antisocial prick that I am, I decided to give the chat a whirl. After a short wait (maybe 2 minutes max? ), Jennifer came online, and within a few minutes, I had a working solution. Apparently the dashes were not needed (despite the instructions), and the number she gave me was.. something other than my own. I don’t care. It worked. I thanked Jennifer, and waited for the confirmation that the Kindle was waiting for me at the store. All this happened on time, within a few minutes of the store opening at 11 AM. At the store, I had one last look at the models, confirming my selection. I went to the online pickup counter, where I presented my ID and credit card, and was handed my Kindle. All in all very smooth! I can recommend this method to anyone visiting the states. I did want a cover for my precious device. I opted for an “official” leather Kindle case, at a slightly salty $39,90 + tax. It does look great, so there is that. And closing the lid also puts the device to sleep, so I’m okay with this. Initial impressions of the device are as expected. Charged it, which took a while. Turned it on, and it wanted a wi-fi connection to register the device, whatever that means. I logged on using my existing Amazon account (to maximize my surveilance footprint), set the time, and I was pretty much done. I had previously purchased the VODO Otherworlds Indie Bundle, which included a number of ebooks in various formats. Conclusions: mobi format works fine, as it’s the native format. Comic-book formats (cbz and whatnot) do not (at least without conversion), PDF’s work… partially. I started reading a PDF course book that I had, and it crashed the Kindle at page .. 65 or something. Out of memory. The file was.. 15 megs maybe? Surely it can’t really be out of memory?? I googled around, and found that PDFs sometimes do that, because they have various scaling issues for the 6″ screen. The fonts might be screwy, the zooming so on might not work. So PDFs work.. with some limitations. Why I was able to load the file, and get to page 65 (maybe it had some specific content on it? ), eludes me. The solutions to this were mostly to use some software to convert the PDF to mobi or something. Haven’t tried that yet. That’s kind of a big minus for the Kindle. PDFs are everywhere. Most of the technical documents I read are in PDF format. If I can’t have a decent solution to reading them, that’ll be a bummer. Ok, this is really long. I’ll conclude by saying: The screen is great. I have not recharged it, after the initial charge, and I read daily. During the evening, I can read without disturbing my SO, since the screen is slightly illuminated. I can use a very low brightness setting while reading at night. Something like 4-7. The 8-week battery promise is with brightness 10, and some Wifi, so I ought to get a good battery life like this. All in all a nice product, with a minus in regards to PDFs. I just bought some scifi that BoingBoing had recommended, and I’m in the middle of one of those. In native mobi format. I also pre-ordered “The Book of PF” 3rd, edition, which was available in mobi-format as well. Looking forward to reading that! Note the ad. The ads are only displayed on the “lockscreen”. Not in the books, between pages or anywhere else. The ad-free version was I think 30-40 bucks more expesive. Pictures taken in fairly poor lighting, and the brightness on the screen was set to 5 (then again the camera automatics lenghten the exposure time). The book being read is “Sword of the Lamb” by MK Wren, all rights reserved, I don’t own any copyrights, etc. etc.